In the crowded United Kingdom festival market End Of The Road stands out for it’s simplistic principles. Wilderness was built on “a passion for the outdoors and the artisanal; a belief in the restorative powers of the countryside and the inspirational powers of craftsmanship and creativity” (eurgh! ); Bestival is less a music festival and more a fancy dress rave, and Latitude is expanding into literature, theatre and comedy alongside music, End Of The Road remains to all essential purposes a music festival. Whilst yes there’s comedy, good food, and a cinema stage, the festival is still built on a simple idea: to combine one of the countries most beautiful settings, Dorset’s Larmer Tree Gardens, with a stunning line-up of acts, seemingly unaffected by musical fads and trends. This simple idea marks it out, perhaps alongside Greenman, as our most anticipated festivals of the summer. Now into’s it’s 9th year, with a capacity that’s evolved gradually to it’s current 11,000 and once again sold out, that principle seems to be working! Whilst the entertainment doesn’t officially being until Friday morning, realising a large volume of revellers arrive on the afternoon before, the festival begins to crackle with life as Thursday evening draws in. The numerous bars do a roaring trade in the locally sourced festival ales, the cinema projects a series of Indie-crowd pleasers including The Double, Inside Llewyn Davis and Pulp: A Film about Life, Death and Supermarkets, and there’s even a small selection of previously unannounced bands, drawing jam-packed crowds to the festivals smallest stage, the Tipi Tent. The first one we take in are Wichita Recordings, London-based Shoegazers, Cheatahs. They blend the traditional, wall of sound, reverb heavy, shoe-gaze sound with some riotously crunchy grunge moments, though occasionally they wallow a little too long, in feedback ridden instrumental sections. When they let the songs shine through, there’s a lot to like and they’re noisy enough to get the impressively large crowd going. 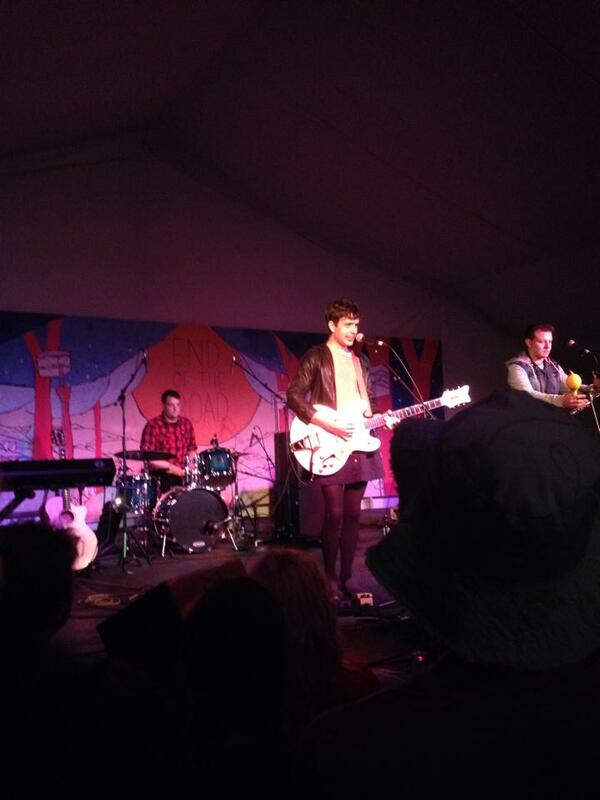 They’re followed on stage by Ezra Furman, and The Boyfriends. A superb choice, not least because we were desperately trying to fit in seeing him on Friday evening, so it saved a tough decision! Ezra is managed by End Of The Road curator, Simon Taffe, and whilst you might be sceptical because of that, anyone who has seen him play would be well aware he’s more than deserving of two sets, heck he could play every day as far as I’m concerned. The Boyfriends are one of those bands, that you struggle to imagine how they even met, let alone formed a band, and that’s before you put Ezra in front of them, they’re a mish-mash of styles, haircuts and stage persona. Ezra emerges looking resplendent, bright red lip-stick, a skirt and a leather jacket; as a front-man he has a nervous, skittish quality, his between song banter somewhere between pleasantly surprised anyone’s here to see him, and down right miserable. Somehow, it doesn’t fit with the frontman on show during the songs, who is a delightful presence. Musically too they’re a real mish-mash, some songs have a punkish quality, indeed two new ones are introduced with the proviso that “if you don’t like them they’re only a minute and a half” whilst elsewhere there’s a glamish quality, and the twin influences of David Bowie & Jonathan Richman are clear to see. Perhaps the best moment see’s Ezra put down the guitar, and take us through the Tom Waitsish piano ballad, Bad Man, with the brilliantly heartbreaking lyric “you’re too bright for me, and I’m too dumb for you.” It’s a beautiful moment, in a fantastically entertaining set that kicks off the weekend in style. With Saturday’s crowd still filtering into the camp-site, and the inevitable question of whether it’s too early for the first pint (only just swinging towards of course not), Phox are opening proceedings on the beautiful Garden Stage. Lined by green hedges, often with Peacocks scrambling on top of them, flanked on one side by a beautiful old singing-stage, it’s an entirely idyllic setting to watch a band, and Phox, a Wisconsin six-piece, are at times equally beautiful. Certainly, frontwoman Monica Martin has a wonderful voice, although the songs are often over ambitious, and don’t quite tie together, when they strip it down to a simple piano line, their country tinged take on a smoky jazz number works well. Phox are followed by an even more ambitious prospect, Arc Iris. They’re the brainchild of Jocie Adams, a former NASA researcher, and member of Low Anthem. She arrives on stage in a gold-lamé catsuit and the music the band make is equally flamboyant, as is her piano playing partner in crime, a man with a hairstyle that’s more fun to watch on it’s own than many entire bands. Jocie floats between instruments, seemingly at her own whim, combining with her lovely vocal that’s a cross-breed of Laura J Martin’s tone and Joanna Newsom’s vocal inflections. They jump rapidly from styles taking in elements of jazz, rock’n’roll and folk sometimes within a matter of seconds. At times it can be a touch overwhelming, though there’s an awful lot of a talent on show, and if the song-writing calms down there’s an awful lot of potential for the future. It’s a sign of how far The Wave Pictures have come that they now sit comfortably on the main stage, alongside the likes of Stephen Malkmus and St.Vincent. The incredibly prolific three-piece, run through a wonderful set of material taken from throughout their career to date. They’re all fantastic musicians, and whilst when David Tattersall refers to Jonny Helm as the greatest drummer in the world, and Franic Rozycki as the worlds greatest bass player, he’s perhaps being a touch biased, they’re all fantastic musicians and a delight to watch. David in particular is a mind-blowing guitarist, indeed some of the songs play out like extended guitar solos without ever being tedious or over blown. Highlights come from throughout their back catalogue; Spaghetti, The Woods, Friday Night In Loughborough and perhaps best of all their closing track Leave The Scene Behind, their recollection of a girl who wants you to push your friends aside, leave the scene behind and get the chance to be the “man that I love”, it’s lyrically and musically fantastic, and a wonderful closer to a set that feels like a band stepping up to the next level. Entering the pitch-black of the Big Top is akin to entering an entirely different festival, and with The Wytches on stage thats quite appropriate. The Brighton trio, are far more suited to the smoke filled, darkness of the tent than they are to a pleasant, green garden setting in Dorset. They deal in grunge-tinged, goth influenced rock music. The crowd are noticeably younger, and the bands appeal makes a lot of sense, they make a very decent racket recalling early-Horrors or McClusky without the sense of humour. There’s nothing ground breaking here, but they’re competent and well received. From there it’s back to the main stage for Jenny Lewis, around five minutes before she’s due to come on, under heavy cloud cover and spitting rain, there’s hardly anyone there! Luckily, just before she arrives, the crowd do, lots of them, and Jenny comes out looking like the consummate rock diva. 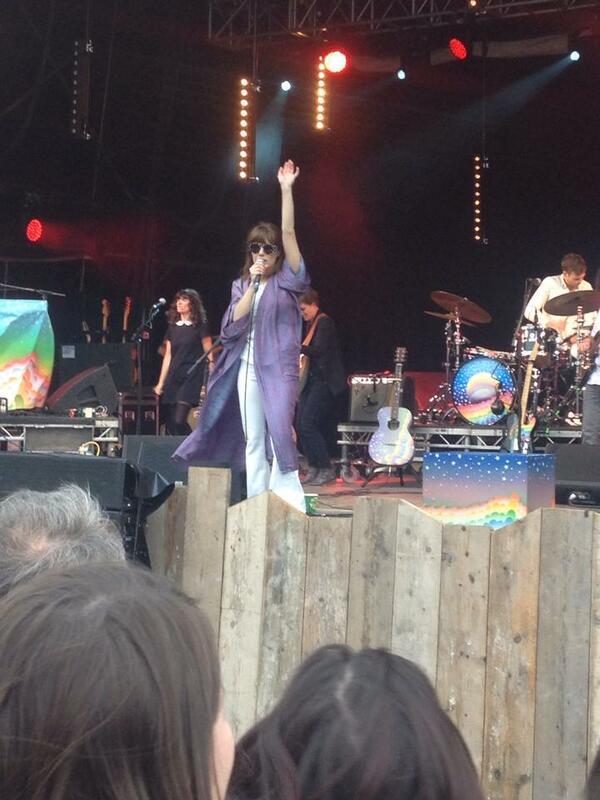 Draped in a long purple kimono, dark sunglasses and a white suit, she even has a rainbow painted box, which serves no purpose but to make her a bit taller when she feels like it. What stands out throughout the set is the quality of her vocal, even when stepping in front of her monitors she’s pitch perfect, and despite being an energetic and engaging frontwoman, never seems to be out of breath or in anyway nervous. A large amount of material is taken from new album The Voyager, but she also dips back to her earlier solo recordings, and a spectacular rendition of Acid Tongue is especially memorable. British Sea Power are surely now well established as one of the great British oddities. Even from the early shows they’d arrive, encourage audiences to deck some of Britain’s grubbiest venues in greenery, bring along giant stuffed bears, wear miners helmets and generally be delightfully different. It’s apparent when they emerge to a packed Garden Stage, little has changed. The crowd still wave twigs in appreciation, the stage is decked in foliage, fittingly for a band who’s lyrics encourage the listener to “drape yourself in greenery, become part of the scenery”, they appear to be less on a stage and more just peering out from breaks in the garden wall. They run through what is to all essential purposes a greatest hits set, dipping back to earlier material from their brilliantly titled debut The Decline of British Sea Power. Whilst they’ve never quite had their breakthrough moment, it’s clear listening to material new and old that what you’re witnessing is a consistently brilliant band, reliable hit-makers who show no sign of decline. Latterly in the set we’re joined in the stage by two giant bears, one brown and one white. It’s impossible not to smile as the Brown Bear makes it’s way to the front and waves it’s paw enthusiastically at the band, it’s a gimmick sure but it’s superbly fun, and like British Sea Power themselves, utterly unique. A tough choice met all the festival goers as St.Vincent and The Gene Clark No Other Band took to the stage at the same time, and, sorry Annie, we love your music but the pull of what may well be the only British date the No Other Band ever do was just too strong… and you know what we don’t regret a thing. No Other is the now legendary 1974 album from Byrds founder member Gene Clark. The fourth solo album from the late Gene Clark was at the time of it’s release a commercial and critical failure, written off as excessive and self-indulgent, it is often see as the death knell of Clark’s solo career. Over time opinions of the album began to change, to the point is now regarded as something of a lost classic, the critics of the 70’s might not have loved it, but based on the stella cast put together to recreate it now, a lot of people do! The brain child of Beach House’s Alex Scally and Victoria Legrand, they’ve created what is surely on the most impressive super groups in a very long time, and recreated the album note for note. The No Other band, featuring members of Wye Oak, Celebration and, of course, Beach House take the stage, and are joined by a series of high-profile guest singers. First to the microphone is Robin Pecknold of Fleet Foxes, who performs the opening track Life Greatest Fool, the track starts of as a jaunty piano number, but as the backing vocalists swing in beautifully, it’s given a gospel swing, a feature of the whole album. Ian Matthews previously of Fairport Convention runs through a folkier, Bert Jansch-like number, before Grizzly Bear’s Daniel Rossen takes on the title track. The song are delivered with pure perfection, and despite the album being 40 years old it sounds as fresh as the day it was written. Hamilton Leithauser emerges later in the set, introduced as “the coolest tall man I know” and he delivers a stunning rendition of “From A Silver Phial” a heartbroken, country ballad, it’s a truly emotional moment, carried by someone who is, to our ears, one of the best singers around, the sort of voice that could sing anything and make it sound fantastic, and when the material is this good it is jaw dropping. The whole rendition of the album is fantastic, but possibly even better is what happens after. Victoria Legrand takes to the mic for an encore, and it’s a reminder of just what makes Beach House special, a true hairs on the back of the neck moment, her voice is just a beautiful instrument, the sooner Beach House get back in the studio the better! That’s not the end though…what happens next is the sort of thing you just don’t think you’ll ever see. Daniel Rossen, Hamilton Leithauser, Robin Pecknold, Ian Matthews and Victoria Legrand, all on the same stage harmonising away together! They perform Eight Miles High, The Byrds 1966 classic, it’s just the sort of thing you think you’ll never see, five of Indie-rock’s most unique and brilliant vocalists all together as one. It’s just an unforgettable moment, and one you leave feeling privileged to have witnessed. A fitting close to a wonderful opening days music, with the atmosphere electric, the delirious punters head off to make their own way into the night, be it to the forest disco, the secret shows in the tipi tent or just a pint of hot-cider and a sit by the fireside, wherever they went next, they’d just witnessed something remarkable.